Third Age launched its Fairyhouse Racecourse Fundraiser at Gordon Elliot’s Yard in Longwood, Co Meath. 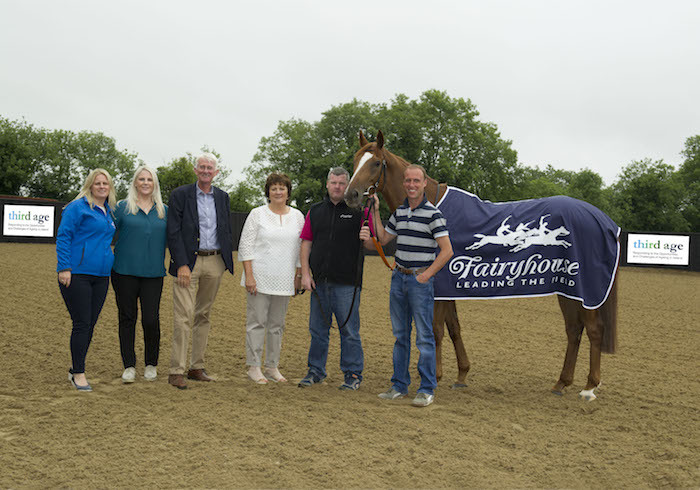 Pictured with Cheltenham winner ‘Flaxen Flare’ are Tom Dowling, chairman of the Third Age Board, Aine Brady, Third Age CEO, Gordon Elliot, Avril Hevey, Manager Third Age AgeWell programme, Gillian Carey, Fairyhouse Operation Manager and jockey Robbie Power. The Fundraiser is a celebration of Third Age’s 30th anniversary delivering national programmes that benefit older people and offering a range of local services in Summerhill. SeniorLine, Third Age’s national telephone service, 20 years old this year receives over 1,000 calls a month from older people throughout Ireland. Failte Isteach, offering free tuition to migrants in 26 counties celebrates its 10th anniversary, while AgeWell, Third Age’s latest programme, provides befriending and health promotion to older people at home. The fundraiser takes place on Saturday October 13, 2018. The package, costing €100 per person, includes admission, bar, tote facilities, three course meal, music, and spot prizes. Call Third Age on 046 955 7750 or email cdalton@thirdageireland.ie for more information.